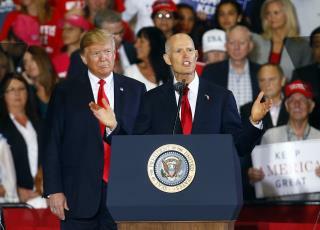 (Newser) – President Trump says law enforcement is looking into a "big corruption scandal having to do with Election Fraud" in Florida's US Senate race, now poised for a recount. "Florida voted for Rick Scott!" Trump continued in a Thursday tweet shortly after Scott sat for an interview with Fox News' Sean Hannity. At an earlier press conference, Scott demanded the Florida Department of Law Enforcement investigate what he says "may be rampant fraud" in the Democratic stronghold counties of Broward and Palm Beach, reports the South Florida Sun-Sentinel. "Votes are coming out of nowhere," Scott said as his lead over Democratic incumbent Bill Nelson fell to 15,079 votes (down from 38,717 early Wednesday), for a margin of 0.18%, per the Hill. In Florida, an automatic machine recount is triggered at 0.5%, while a hand recount comes with a margin of 0.25% or less. Lying cheating Deceiving democrats. Did you think they were anything else? Corrupt Republicons How many more indictments!!!!!! !